We are all very well acquainted with the collective fascination surrounding solid, moody colours, bold animal prints and structured silhouettes that are synonymous with the Fall/Winter season in general. However, this season, designers decided to take on inspiration from all corners of the world of nature and botanical gardens and relay it onto fabrics using varied techniques. The detail of choice has come to pass as the dainty floral, seamlessly transitioning its inherent nature for the colder months of the year. Swirling prints of florals and paisleys, mixed-and-matched in a variety of colourways and patterns that cause the eyes dance and the brain go into a bit of a tizzy, will be adorning most ensembles in the months to come. The updated value additions this season, include traditional floral motifs, tropical palm prints, an affair with sporty outerwear being balanced alongside techniques that encompass patchwork, 2D renderings, appliqués and lace embroideries, all reinvented for Fall/Winter 2017-18. We were forced to look past layers of illusion owing to delicate fabrics, like intricate lace, fluffy tulle or silk chiffon decorated with floating florals embroidered and sewn in patches and 3D appliqué work – often embellished, but never dull. Although embodying different aesthetics and clientele, designers and brands alike, seemed to reach out for achieving same accent. For proof, you can check out our analysed and researched report curated for the upcoming season to get a cue into the wide usage of the floral detail as a trend, across various product categories and techniques. For starters, micro florals aren’t the new kid on the block when it comes to prints, but what makes these specifically stand out is the fact that this season, florals venture out of their confined summery territory to exude femininity to the darker side of the Fall/Winter season. Designers and high fashion labels generously sprayed micro-bud patterns over dresses in varying sizes ranging from the mini to the midi to the full-length styles in moodier tones as compared to their Spring/Summer counterparts. A trend typically reserved for the boys, this season saw us re-evaluating gender stereotypes in a big way by introducing trends that seamlessly transition into one another. As comfort and utility-based outerwear continues to take centre-stage, designers shift their focus on performance as much as they do on style – juxtaposing the two together. Voluminous silhouettes playing on proportion, shapes, lengths and colour, found their way onto hi-tech materials giving rise to the puffer/padded jacket for the colder months. A dainty and softer touch has been lent on to seemingly sporty padded/puffer jackets by introducing floral renditions over these luxe outerwear pieces for the coming season. It might come across as odd but florals were taken a bit far from their norm of being associated with feminine, flowy silhouettes and were presented as the print of choice for all-over head-to-toe looks embracing the same story throughout an ensemble. Designers and brands both are pulling out all the stops for the head-to-toe looks by introducing bold, oversized florals and repetitive flowery pattern placements over ankle-length dresses, coordinated pant-suits and maxi coats. As a designer, it is impossible to not represent the ongoing social agenda around you. So when all the boundaries around us seem to be blurring, it comes as little surprise to see the ingenious concoctions of different styles of prints and fabrics coming together on numerous runways. 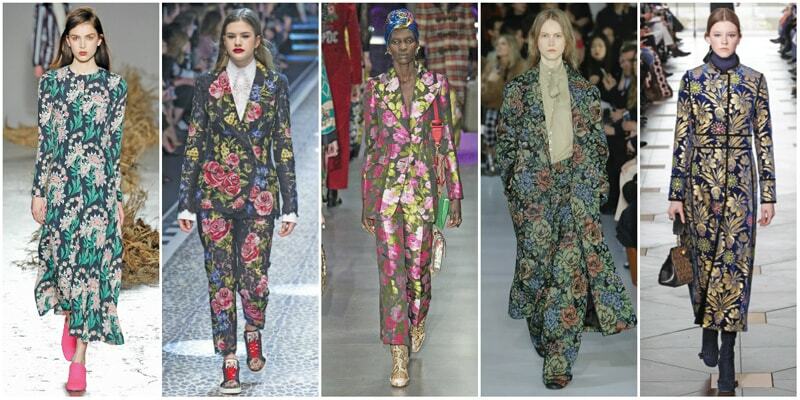 Whether it was the seamless juxtaposition of proportions, size and colour of floral placements with one another or a more contrasting approach in amalgamating different patterns – mix-and-match is a key trend in keeping it together this Fall! This season saw garments being hand-dipped in watercolour to create museum-worthy pieces. Abstract and artistically rendered brushstroke florals appeared over sheer dresses, silky button downs, satin skirts and jackets. The floral canvas followed a palette of olive greens, rusty browns balanced alongside pastel blues and pinks. Delicately constructed chiffon and sheer dresses infused with laser cut appliqué flowers lent a whimsical vibe to 2D renderings. Designers went all out and injected high-end floral patchwork onto luxe materials such as velour, fur, leather and even suede. Everyday materials such as denims and knit sweaters were adorned with embellished versions of floral motifs that set well with both feminine and masculine silhouettes. Colourful appliqués of embroidered pansies adorned countless looks encompassing sheer and satin materials, all exuding a whimsical and dreamy charm. Boundaries of taste and prudence were seemingly pushed and tugged at for the Fall/Winter 2017 season which saw the rise of a maximalist attitude translated through the use of guipure lace presented in a myriad of floral designs. Lace was embroidered, layered, patched and mixed to unveil a fabric strong enough to hold its own alongside other luxe offerings of the season such as velvet, velour and brocade. Flower-on-flower fantasies were created to compliment even the most serious looks that steered towards menswear suiting trends.